Synonyms: Acanthus mucronatus, Barleria spinosa Wall. 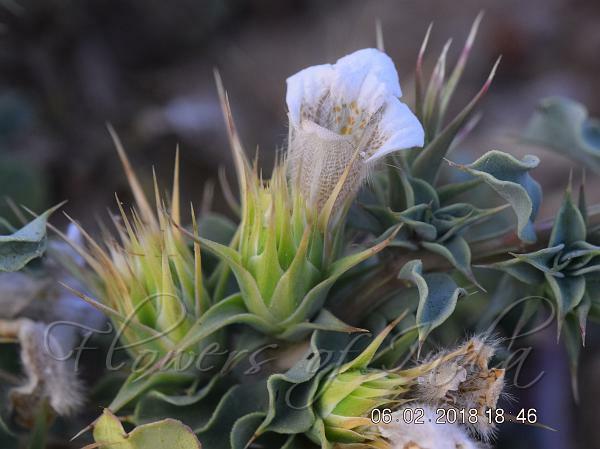 Spiny Lepidagathis is a herb, straggling and creeping, scarcely velvet-hairy. Leaves are opposite, 2-3.5 x 1-1.5 cm, lanceshaped, entire, fine-tipped, velvet-hairy on both surfaces; lateral nerves 4-6 pairs, spiny at the tip of the leaf; leaf-stalk 0.5-1.5 cm. Flowers are borne at branch-ends or in leaf-axils clusters, a bunch contain 6-9 spikes, about 2 x 0.5 cm, compact; bracts 0.3-0.4 x 0.1-0.2 cm, lanceshaped, pointed, glandular with hairy hairs on the surface; bracteoles membraneous, white coloured with brownish tip, tapering 0.4- 0.5 x 0.1- 0.2 cm. Sepals 5, fused, one is slightly larger than the others, 0.5-0.7 x 0.2 cm, lanceshaped, tapering, glandular and hairy on the margin. Flower are two-lipped, white with dark velvet-hairy pink spots on the 3 lobes and small pink dots on the central lobe, glandular hairs on the flower tube and the petal lobes. Stamens 4, didynamous 0.2 and 0.1 cm long, anther lobes about 0.1 cm. Fruit is an ellipsoidal capsule, hairless pointed tip, about 0.4 x 0.2 cm; seeds 2 hairless round. 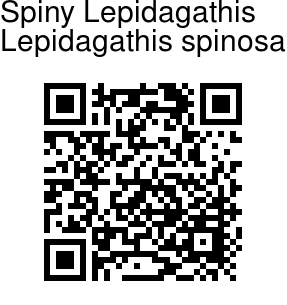 Spiny Lepidagathis is endemic to Southern Western Ghats. Identification credit: Siddarth Machado Photographed in Bantwal taluk, Karnataka.